Firstly, I don’t (in general) buy booze to collect or as an investment. I did a bit of a reorganisation of my whisky cupboard(s) today which showed me that I have more bottles that I’m not drinking than I thought, but so far I’ve not bought any of them from an auction. I see auctions as a good way of getting reasonably priced drinking boozes that you can’t find down the shop. I’ve mainly stuck to whisky so far, although you can find pretty much any spirit online, and all of the bottles I’ve bought (with a pair of exceptions that were bought due to one half of the lot being distilled in the year I was born) have been old versions of whiskies that are still around today. Over the years recipes change and over decades there can be small changes in bottled spirit, so old bottlings are often quite different to what you can find today. My current ‘problem’ has been 10 year old Laphroaig. Ever since m’colleague gave me a dram of a 1990s bottling that he’d picked up in an auction I’ve been focused on finding another like it – almost entirely without smoke but with a massive slab of passion fruit juice, unlike anything else I’ve tried. Since then I’ve picked up a couple (and have vowed to stop looking for more, although that will probably last until the next auction) and very much enjoyed them – they weren’t the passion fruit awesomeness of Tim’s, but they were both different to the Laphroaig 10 you can find in almost every off license. So far there are a few places that I’ve played around with auctions, the first being McTear’s. They are a well known brick-and-mortar auction house in Glasgow who do regular wine and spirits auctions, specialising in whisky. Over in the east there’s also Bonham’s, Edinburgh’s auctioneers, who do the same but who I have carefully avoided so far so as not to destroy my bank account. The main thing to realise when bidding in any auction, especially with old school auctioneers, is how much you will pay in the end. The price that you bid (with the winning bid known as the ‘hammer price’) is just the start, with McTear’s adding on a buyers premium of 18% + VAT for all sales and 3% + VAT for internet sales, coming to a total of about 25% on top of what you’ve bid. For example, if your winning bid is £100 then you’ll also pay £18+VAT (£21.60) premium and £3+VAT (£3.60) for a total of £125.20. On top of that you’ll need to get your lots home, with postage and packaging potentially adding on a large amount more – McTear’s are pretty good with postage, but it can run to £10 a bottle for small numbers, although they’re also good at keeping lots in storage if you think you’ll be bidding in later auctions and want to bundle up several purchases together. Prices at any auction will depend on the mood of the room, for values of ‘room’ that now include people bidding online. The auctioneer plays an important role, as I’ve discovered by listening in to the auctions online (McTear’s provide an audio feed to give some more of a feel of what’s going on, although sometimes it gets out of sync which can lead to internet bidders jumping in late to find a lot has already been sold), with some of them dragging bids out of reticent buyers while others can dampen down the room to give some bargains (as the £30 I paid for a 1990s Highland Park 12, as well as a bottle of Tobermory that they’d bundled with it that I look on as a free gift, will attest – we have similar bottles up for £90 at work). It pays to research the catalogue beforehand to work out what you want to pay attention to, find bottles hidden in large lots (McTear’s seem to like bundling less interesting bottles in with something decent as well as writing long descriptions that don’t fit an entire list of bottles onto their catalogue index page – it’s worth clicking through on many of them) and work out how much things are worth – their predicted prices aren’t to be trusted, as they often seem to be no more accurate than picking random numbers. For price enquiries I generally use work’s website, as we have lots of old bottlings (the boss is a regular at auctions), but there are many other online resources still selling or listing prices of when they last sold items. McTear’s next auction is on February 22nd (luckily I’ll be on holiday and hopefully hidden inside a distillery while it’s on) and the catalogue is up now. The value of the item is in the collectable container, not its contents. The container has not been opened, but any incidental contents are not for consumption. This item is not available in any retail outlet and the container has a value that substantially exceeds the current retail price of the contents of the container. As the seller I will take steps to ensure the buyer of this collectable container is of lawful age in the buyer and sellers jurisdiction (18 in the UK and 21 in the US) and that I am in compliance with any and all applicable laws and shipping regulations in carrying out the transaction. That seems to be enough to keep eBay from killing your auction, although there were lots of unwanted bottles of Laphroaig for sale after Christmas that laughed at numbers 1 and 3 which shows that they’re only really paying lip service to their own regs. The thing to keep an eye on with eBay is the amount of postage, typically £10 a bottle, as a nice way to jump the price up for the seller. Other than that it’s just the same as a regular eBay auction, ie you will probably need to use a sniperbot if you want to win anything that’s going to be hotly contested. Luckily for me I haven’t had to fight for anything, as I don’t snipe as a (foolish) matter of principle, and have managed to pick up a reasonably priced bottle of pre-Batch 1 Laphroaig Cask Strength and a 1978 (my birth year) Hutcheson’s Colheita that will sit on the side and wait for my birthday to roll around. 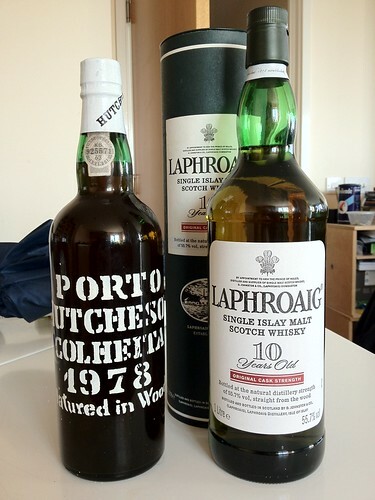 Check the lot description – I didn’t realise I’d bought a litre of Laphroaig until it arrived…which was nice. The final auction place that I’ve played with, but not yet bought anything from, are specialist online booze auctions, specifically ScotchWhiskyAuctions.com and WhiskyAuction.com. These two do things in a different way to eBay with each auction featuring a large number of lots and bidding open for several weeks before closing the auctions at a pre-ordained time. 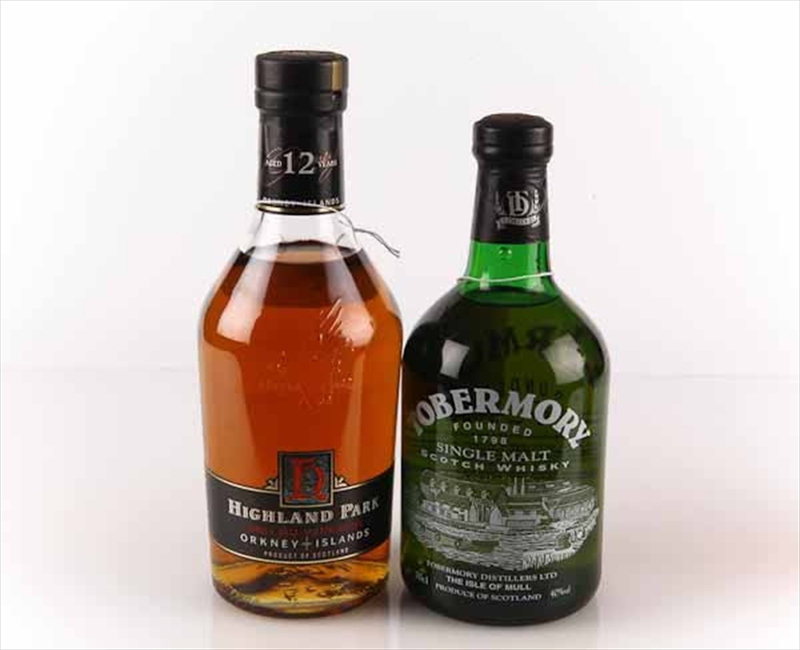 The two sites also differ slightly in their approach, with ScotchWhiskyAuctions extending bidding by 15 minutes if someone bids close to the end of the auction, to try and stop sniping, and WhiskyAuction not charging buyers any fees. They also differ due to the former being based in Scotland and the latter Germany, which will affect the price of postage somewhat. I bid in the most recent ScotchWhiskyAuction (including on a rather lovely looking bottle of SMWS Caledonian grain whisky that was distilled in 1978) but ended up dropping out of all of the lots before the end as the prices got a bit too rich for me – something that is a lot easier to do with the slower moving auctions rather than eBay’s frantic last minute bidding and the live auction’s compression of the entire bidding process into minutes. There is danger of getting caught up in the moment, as a couple of purchases of mine have demonstrated to me, although only to the tune of a few quid, but at the same time that’s part of the fun of it – there is a remarkable amount of adrenaline rush to be found in winning a lot that you really want.